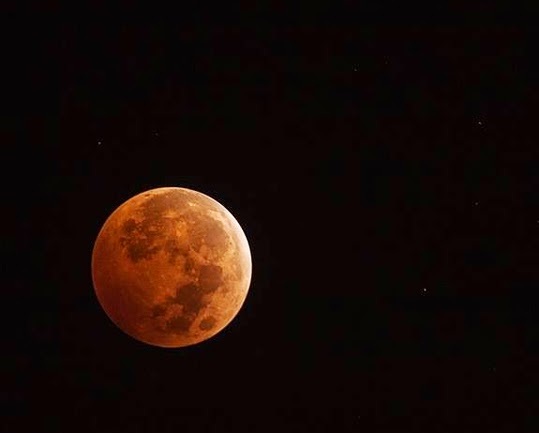 Being sent this amazing image of last week's Blood Moon made up for the fact that the lunar eclipse that gave the moon a reddish hue wasn't viewable from the UK. The photo was taken by James C Wallace II, author of fiction set in the world of Oz. James lives in America where the eclipse was visible. He said: "I thought you might enjoy the most recent lunar eclipse, which everyone seemed to refer to as the Blood Moon." James is an astronomer as well as an author and has in the past very kindly sent me lots of other photos of the beautiful moon - you can see links to some of them at the bottom of this post. He added: "I also include a short story/blog posting I wrote for an online Oz celebration earlier this year." The most recent novel in James' series of books is The Emerald Slippers of Oz. The photo is copyright James C Wallace II.